SCDG delivered equitable development capacity building technical assistance, research and stakeholder outreach. Cumberland Region Tomorrow is a regional transportation network and statewide voice on next generation infrastructure solutions. The network’s equity goal is creating and enhancing access to opportunities for all people. 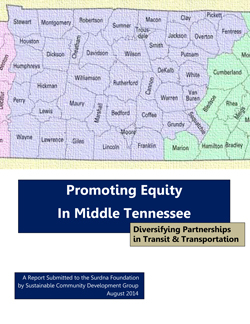 Technical assistance and the report focus on improving equity measures, inclusive network leadership and advancing the equity dialogue in Tennessee. Recommendations include strategies that strengthen connections to grassroots civic infrastructure and leaders from low income communities and communities of color; collaborating to improve equity measures and inclusive leadership; and forging diverse partnerships that strengthen transportation networks, infrastructure investments, neighborhood access to transit and jobs, and public safety. Project funding was generously provided by the Surdna Foundation. SCDG conducted the federal study for EPA’s Office of Environmental Justice. The report surveys public programs and funding sources that assist community leaders with incorporating sustainability into local community and economic development. Delivery included research design and analysis; identification of diverse stakeholders; evaluating community capacity building best practices and tools; and strategies that align EPA’s and federal policies, programs and grants. Stakeholder dialogues examined community capacity to engage in the land use and zoning process, municipal and transportation planning, historic preservation, environmental cleanup and job creation. SCDG managed the distinguished consulting team of john powell, Kirwan Institute for the Study of Race & Ethnicity at Ohio State U., Angela Glover-Blackwell, Policy Link, and Robert Bullard PhD, Clark Atlanta University Environmental Justice Resource Center. The team produced the Cleveland and Northeast Ohio study of the region and Cleveland’s African American community. The report examines historical policies and regional dynamics of urban decline, suburban sprawl and community disparities. 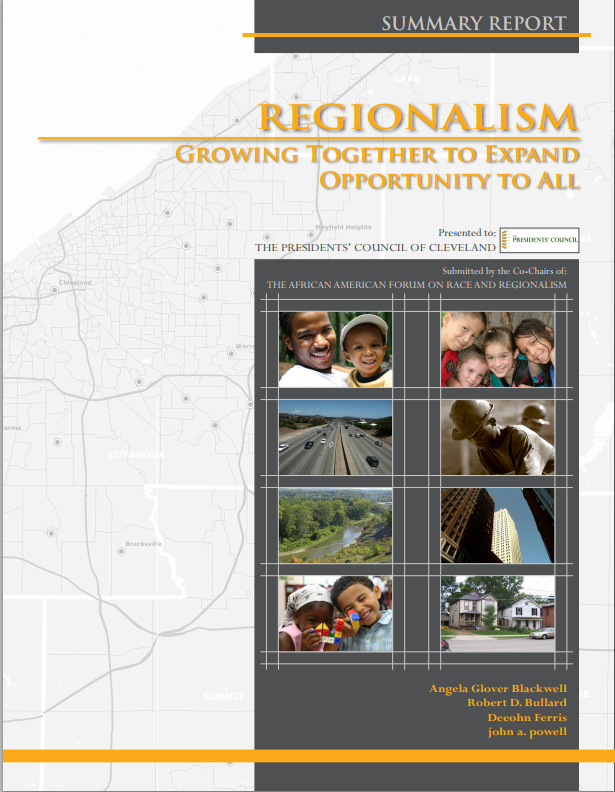 Regionalism is explored as a potential solution to address the challenges, connect people to opportunity structures, reduce disparities in resources and competition between communities in the region, and manage the sprawling development patterns. The project was commissioned by the Cleveland region’s President’s Council, prominent African American corporate executives, elected officials and academics including Mayor Frank Jackson and US Rep. Marcia Fudge; and it was funded by the Cleveland Foundation. 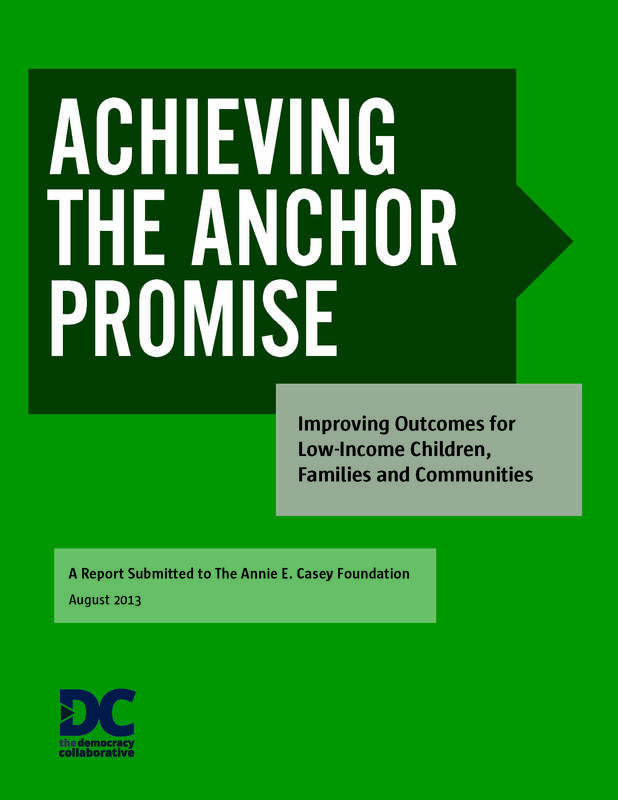 SCDG conducted surveys and research informing the Democracy Collaborative project: “Linking Anchor Institutions to Outcomes for Low-Income Families, Children and Communities,” a study for the Annie E. Casey Foundation. Anchor institutions, universities, hospitals and other entities, are rooted in local communities by mission, invested capital, or relationships to customers, employees, and vendors. As place- based entities controlling immense economic, human, intellectual, and institutional resources, potentially they generate crucial local benefits to communities. Applying an equity lens, the study facilitates development of metrics that measure beneficial impacts and increase community accountability. Equitable community economic development recommendations incorporate identifying opportunities for collaboration with locally based community organizations; evaluating partnership challenges; and addressing barriers. SCDG identified and interviewed community-based leaders in the field and developed summary findings. SCDG provided technical assistance and analytical support to advance strategic public policy partnerships between civil rights groups, environmental and environmental justice organizations and Native American communities. Partnering with the George Washington University Center on Sustainability & Regional Growth, SCDG staff facilitated key organizations in organizing a working framework that supports collective legal and policy initiatives, litigation and advocacy including Title VI of the 1964 Civil Rights Act. SCDG staff prepared the national consensus policy recommendations and strategy document that was a core element of this project which was initiated by the Ford Foundation’s Community and Resource Development Program. The report results from research, data collection, interviews, a public forum on US Supreme Court actions, and a national meeting convened in Washington, DC. SCDG coordinated planning, managed and delivered the Ford Foundation’s Environmental Justice Next Generation Leadership Development Forum in New York City including commission of authors and papers; organizational and leadership development technical assistance; commission of papers and interdisciplinary authors; editing; and event facilitation. SCDG executed logistics, administered contracts, and paid honoraria. To promote and coordinate inclusion, criteria were developed which ensured invitations to broadly diverse youth and next generation leaders from across North America who represented African American, Native American, Asian Pacific Islander, Inuit and Latino communities. 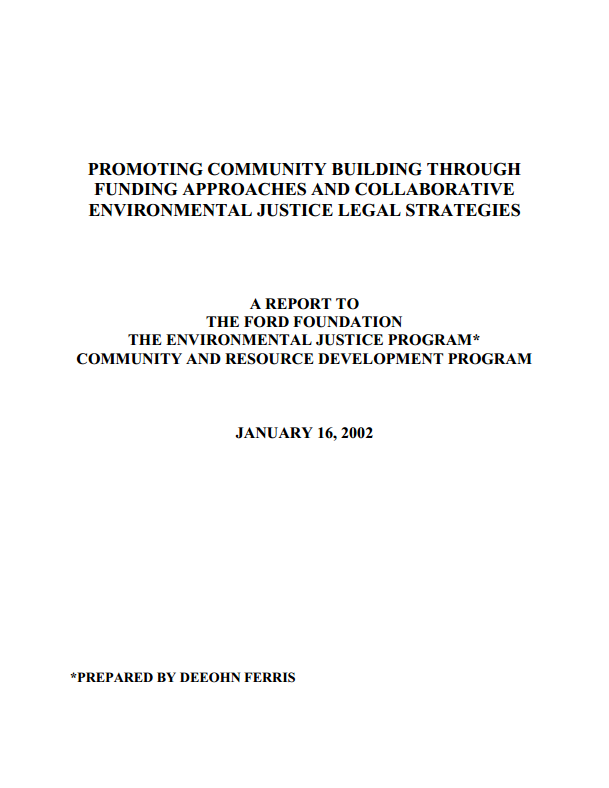 The Forum was commissioned by the Ford Foundation’s Environmental Justice Program.